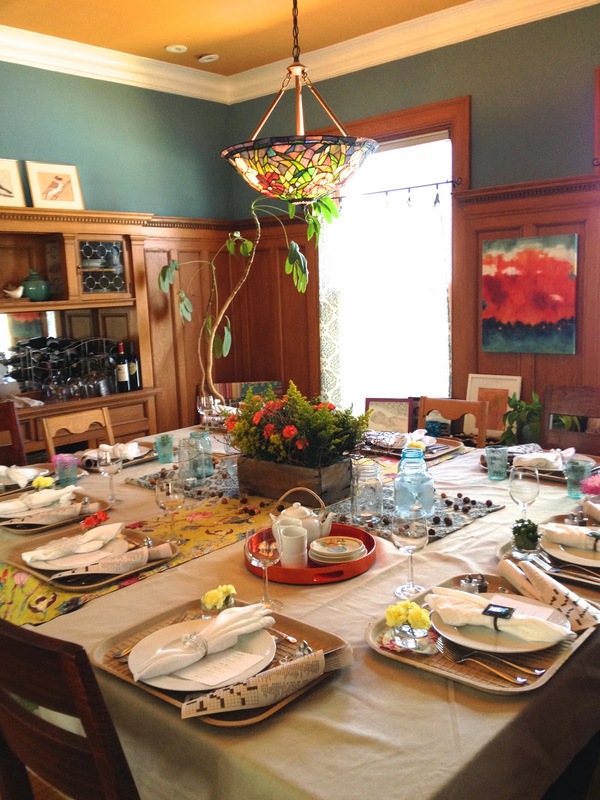 Matt and I hosted Gourmet Club at our house last month. The group, which consists of six couples, tries to meet 5-6 times a year. The couples take turns hosting at their homes. The host couple plans everything (the theme, menu, drinks and decor) and makes the main dish + provides all of the drinks. The rest of the couples bring the other courses (appetizer, salad, dessert, etc). It's a huge undertaking, planning everything and pulling it off successfully, but it's lots of fun and totally worth it! 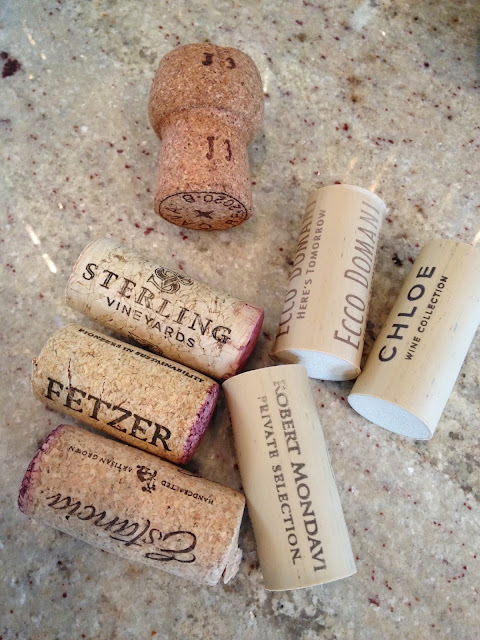 The last time we hosted was way back in October 2013 (I was pregnant with Chloe and couldn't drink the champagne....not that I remember that detail...). The theme we chose then was Julia Child recipes and you can see photos from it here. The menu was a bit tough to decide on because we wanted to 1) make breakfast foods but still have it feel like 'dinner' 2) have six courses that melded well with a mixture or savory & sweet (we asked ourselves - what salad do we make for breakfast? do we need a seafood dish for breakfast?) 3) still have it feel 'gourmet' enough (how do we put a gourmet twist on pancakes?) 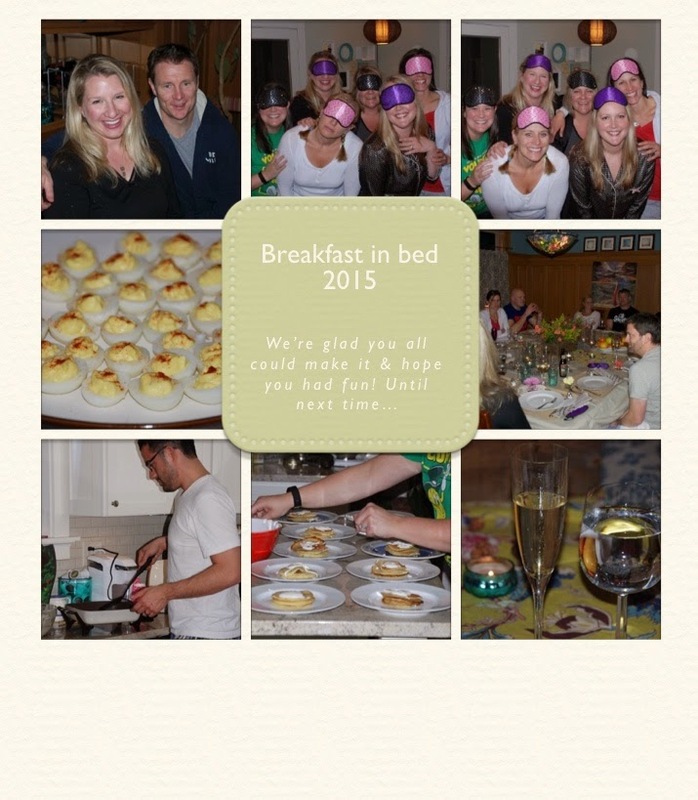 and 4) make the mood/decor/ambience feel like we were eating true breakfast-in-bed style! 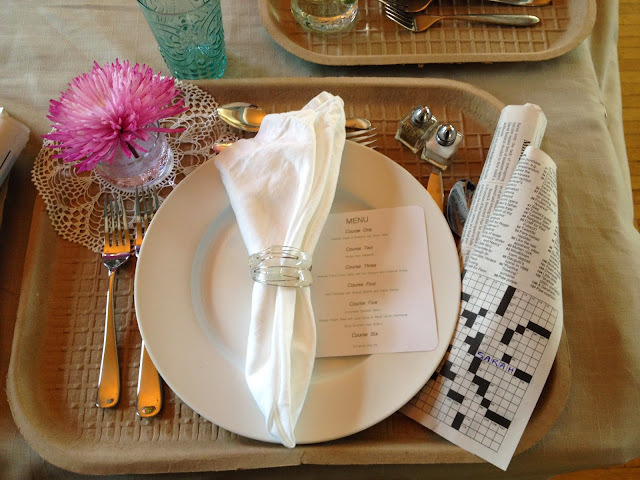 After perusing cookbooks and pinning a hundred things on Pinterest, we set the menu and sent the invitation out. We also required people to wear their pajamas, which added a touch of fun to it! I didn't get many photos of the actual food because I was so busy serving drinks, making food and socializing, but I did get a few photos before the party started of the table that I decorated all by myself! I wanted to give the table a 'breakfast in bed' feeling and also had to set up spots for TWELVE people to sit! Our dining room table only seats 8 comfortable, so we had to borrow tables from friends and create one large square table to accommodate everyone. That's twelve sets of plates/bowls/dessert plates/etc and twelve settings of wine glasses/water glasses/etc. 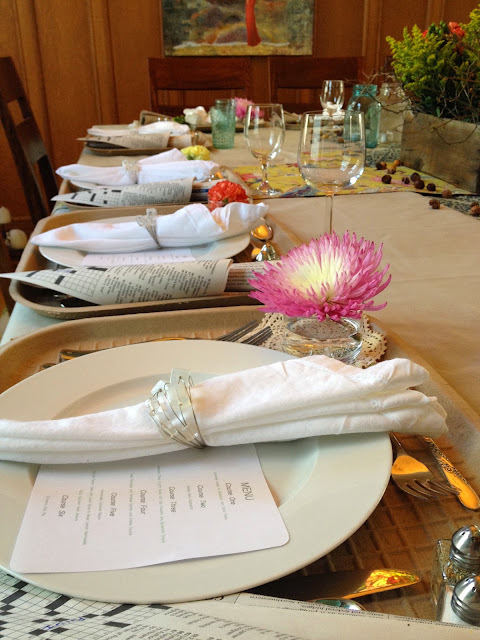 Twelve cloth napkins to fold, mini flower vases to fill and silverware sets. Luckily I have extra sets of silverware from Matt's grandma, extra glassware from our wedding yet and a mom that graciously let me borrow more plates! The table-for-twelve squeezed into our dining room. 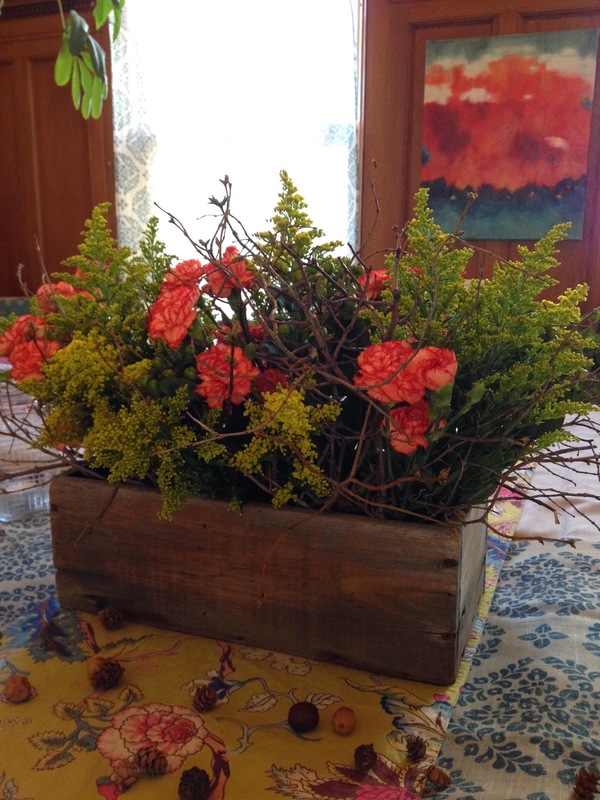 I bought flowers from the grocery store and collected sticks from our yard and put them in an antique wooden box as the centerpiece. 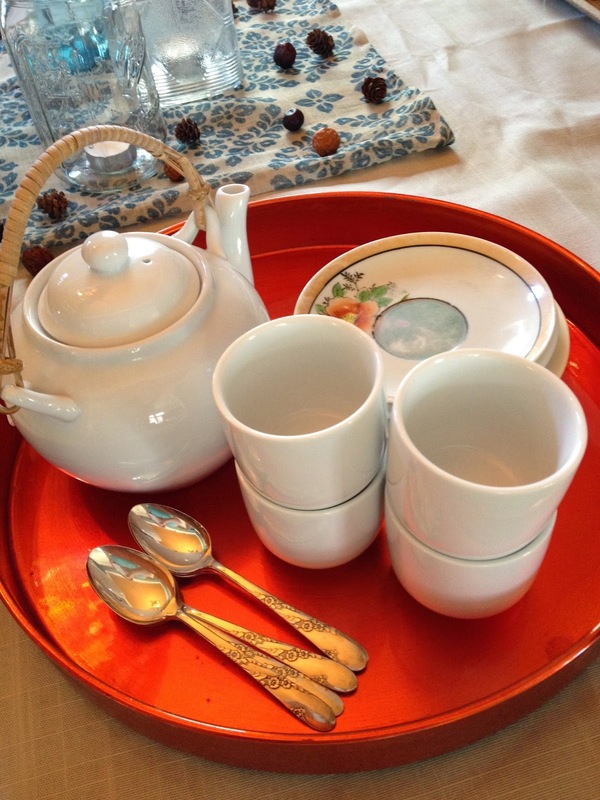 Tea set ready in case anyone wanted tea. For namecards I rolled up pages of crossword puzzles and added everyones names. 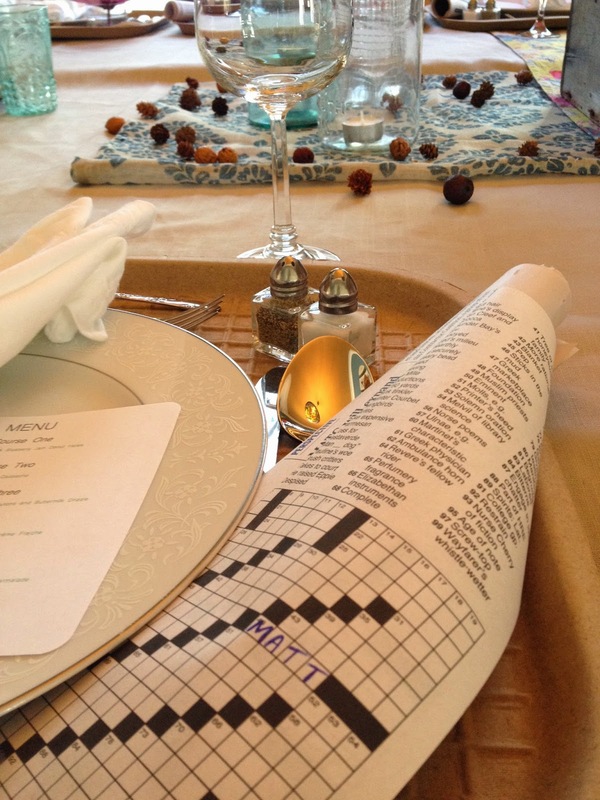 I thought the crossword puzzle added a 'breakfast in bed' touch. And I ordered inexpensive paper trays and mini salt&pepper shakers online. For easy, simple and rustic decor I used old mason jars and tea light candles all over the table. Glasses ready for gazpacho soup. Appetizer plates, dessert plates and martini glasses - check! 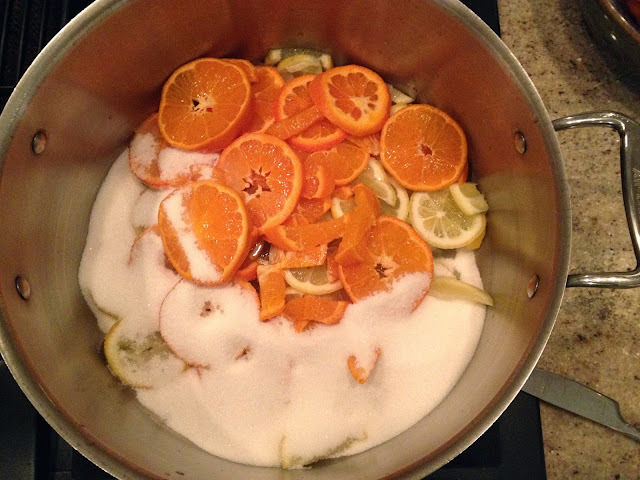 Cooking a pot of meyer lemon & vanilla bean marmalade to serve alongside our french toast. Forks/knives/spoons -- antique, vintage or Target! Martini glasses -- borrowed from people, so I'm not sure! I wanted to mention which of these recipes the group seemed to like the most: I think the consensus was that the Avocado & Oat Crouton Salad and the Cinnamon Roll Cake were the evening's faves.